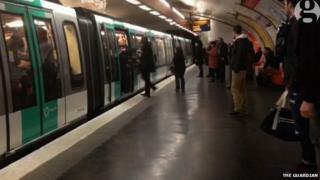 The incident took place before a Champions League match in the city. Chelsea FC said it would help police, and any fans involved faced a ban. The Metropolitan Police said it was taking the incident "very seriously". In a statement it said it would assist French authorities to identify the people involved and support them in any action they chose to take. "We will examine the footage with a view to seeing if we can apply for football banning orders, preventing people from travelling from future matches," a spokesman said. British expatriate Paul Nolan, who filmed the incident on his phone, told the BBC it was an "ugly scene" and "very aggressive". Speaking on Radio 4's Today programme he said he could hear mentions of World War Two as well as the racist chanting. He said he and the people around him all felt quite threatened by the scene. "I think there was a certain amount of pack mentality," he said. Mr Nolan earlier told the Guardian that the man trying to board the train was "completely shocked" when he was pushed off. "I don't think he realised who they were," he said. "There definitely was a culture shock. I heard a couple of French guys saying: 'I can't believe this. It's insane'." "Should evidence point to the involvement of Chelsea season ticket holders or members of the club, we will take the strongest possible action against them including banning orders," he added. European football governing body Uefa said it was "appalled" by the incident but added: "As it occurred away from the stadium it is outside Uefa's remit to act." President of Fifa Sepp Blatter also condemned the actions tweeting: "There is no place for racism in football!"